Baader Alan Gee Mark II focal reducer is characterized by a very high correction on a completely flat field and full compatibility with many telescopes: for example is perfect for Schmidt-Cassegrain ones. The new Alan Gee Mark II focal reducer can be used with almost any amateur telescopes (except most Newtonian) and offers great advantages CCD cameras imaging because it reduces the focal length by a factor of 0.59x to 0.35x (it requires optional adapters depending on the model). We advice the use of Alan Gee Mark II focal reducer for cameras with sensors up to APS-C (24x16mm). How is the Alan Gee Mark II connected to the telescope? In order to use it with a Celestron C8 telescope, you need to add the "Baader T2-SC ultra short adapter" 2958500B following this scheme. in this way you can use the focal reducer with many telescopes like Maksutov-Cassegrain, refractors, Schimdt-Cassegrain, etc and, on camera side, you wil have a T2 thread. 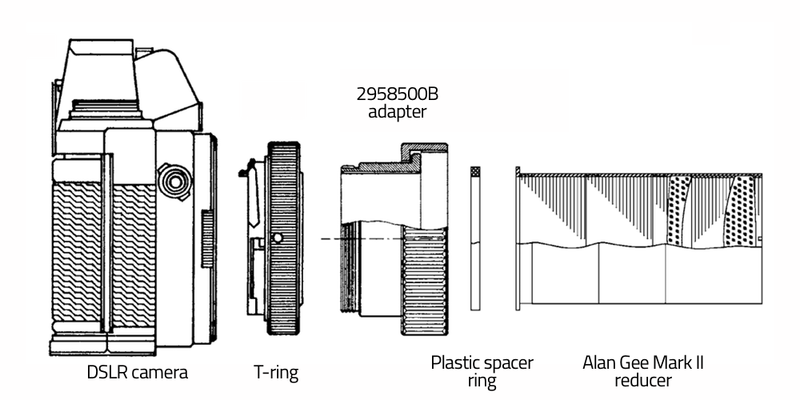 For this use you need also to use: "T2/2" photographic adapter 2408150" and "T2/T2 inverter ring 1508025"